Senior Congress parliamentarian Shashi Tharoor, sustained head and leg injuries during a popular tulabharam offering ritual at Gandhari Amman Kovil temple in Thampanoor on Monday, April 15, 2019. The incident happened when a portion of the weighing scale on which Tharoor was sitting, broke and fell on him. Party workers rushed him to Thiruvananthapuram government hospital immediately. As per hospital reports, he has received eight stitches on his head, however, his condition is reported stable. 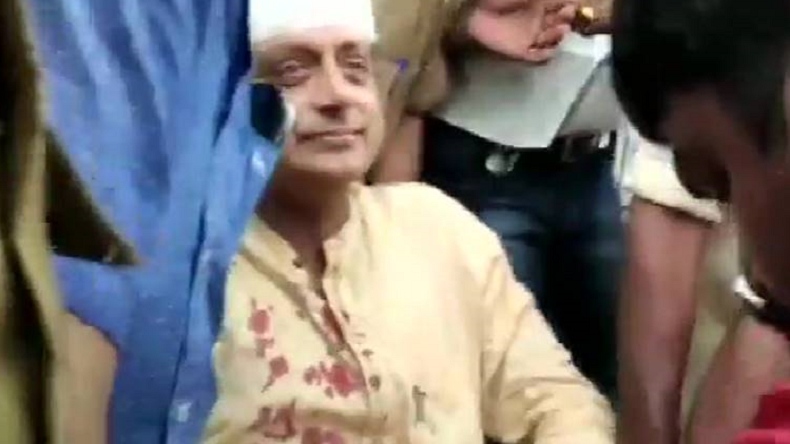 Senior Congress parliamentarian Shashi Tharoor, who is on a campaign spree sustained head injuries, at the Gandhari Amman Kovil temple in Thampanoor during a popular tulabharam offering ritual on Monday, April 15, 2019. The incident took place during a ritual when a portion of the weighing scale on which Tharoor was sitting, broke and fell on him. Soon after the mishap, the party workers rushed him to Thiruvananthapuram government hospital. Later, he was referred to the medical college hospital. As per the hospital authorities’ reports, Tharoor has received eight stitches on his head, however, his condition is stable. He also underwent scans to check internal head injury. Doctors say he is out of danger. Local media channels reported that Tharoor can be seen wearing a blood-stained shirt and in a heavily bandaged condition while being wheeled into a hospital. This is not the first time that he participated in a tulabharam ceremony, earlier also in Kazhakkoottam constituency, he attended it before commencing his election campaign from there. He took to his Twitter handle to share details. In the tweet, he mentioned that he had started his paryadanam of Kazhakoottam yesterday on a unique note – with a ‘thulabharam’ of bananas. At least in temples, he could claim to be a heavyweight politician. Earlier, he wished Vishu greetings to his 6.85 million followers on Twitter handle. He tweeted that for the first time in decades his sisters and he were blessed to have their eyes opened for Vishu Kani by their mother. He further added that he is overjoyed to re-live childhoods this Vishu. At the end, he wished everyone with Vishu blessings to all and a wonderful year ahead.